The little hole in the upper left is for a door knob. Next I need to sand, prime, and paint the frame. We may do the same thing to the door of a corner wall cabinet as well. It's a nice way to not waste the tin panels, as well as coordinate the look of my kitchen, don't you think? What a great, and beautiful looking, idea! I DO think it is a nice way not to waste, and to coordinate. I think it looks wonderful. Great job. I have an idea for you. If you have one tiny little square left over, you could make one of those little candle shelves that the "pioneers" used with a square of the tin on the back to reflect the light (and protect from the flame). I am loving your kitchen posts. Thank you so much for sharing. Great way to coordinate! And so custom, and personal, too. Very nice! 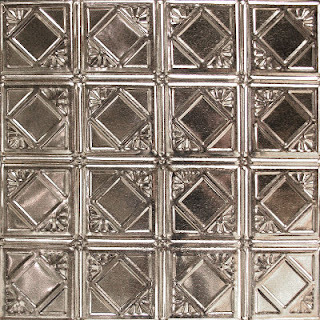 I have been looking for a good deal on tin tiles for the outdoor kitchen. I like the look. What a fantastic idea - I LOVE it! I would never have thought to do that with the leftover tin and it really looks great! Thanks for sharing! Those doors are wonderful! What a great idea ~ I love using up leftovers of all kinds. I hope you post them after your paint job, too. Geesh! Not fair. Not only do you and your hubby have talent but you come up with the coolest ideas! I do think the two of you should go into refurbishing old homes for fun and profit. (You know this was said with tongue firmly implanted in cheek as you would NEVER reclaim the time it takes to do all the fantastic building/decorating you do!) Your home is going to be a showcase! And I, for one, sure do appreciate you sharing everything with us. Well done. Looks great too. Love it! Of course, I'm insanely in love with the tin ceiling look, so fitting it in anywhere is just fine by me! 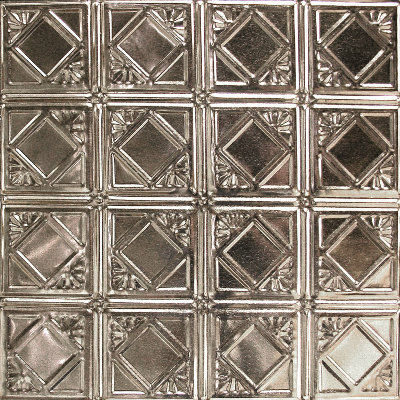 ohhh, you could make a pie cupboard and mimic the pattern of the tin ceiling, with punched holes in the front of the cabinet.. So many ideas spring from one simple transformation. I grew up in an old Victorian style house and our kitchen cabinets looked very much like this. They look authentic and period correct for your wonderful kitchen. Good job! So pretty, and what a great way to up-cycle! Natalie, that's a really good idea. We should have some left, even if we do a 3rd door for a upper corner cabinet. Thanks! Nina, there are so many ideas, I agree! Martha, thank you for that! This looks beautiful! I'm impressed with how you are coming up with all of these ideas. That's nice. Good for you for using it! And it'll tie in so well. Back in our first house, we had a big wall that needed a big statement. I bought 4 very fancy tin panels, painted them, and distressed them. I put them on the wall in a big square and trimmed the outside with some trim from the hardware store, so they were framed just like a painting. It was beautiful. Tin can do a lot of really nice things, I think. Awesome Idea! We want that on our ceiling when we remodel the kitchen! LOVE IT!! I can't wait to see it all painted! Another great idea! And you may have given me one! Remember I want to cover the walls in the kitchen and dinning room with T & G pine. But the Oak cabinets wouldn't work with the Pine. So if I remove the door panels and replace them with the T & G and then paint the frames and faces of the cabinets? Jocelyn, what a great idea. You should submit a photo to the company you bought them from. They'd love another idea to promote their product. Stephanie, Clint, Woody, and Mystic Mud, thanks! Tom, actually I think that would work really well. Furniture combining both painted and stained surfaces is very popular right now. The paint would "hide" the differences in the wood, But frame & highlight the T&G beautifully. You know, it's the little extra touches like this that will make the kitchen seem so special and coordinated. I have the feeling it will end up being your favorite room in the whole house. Oooh, I love this! I've considered trying to revamp an old china cabinet with punched tin panels, but I think this might be even better. Kari, what a great way to update an old china cabinet. Either way. Actually you could punch this type of panel for added detail. Curious? did you put the oak panel behind the tin for a backer or is the tin of sufficient gauge that it will resist a hard bump and not fold on you? Woody, Dan's going to put the panel back after they're painted, using retainer clips for picture frames. I'll have pictures to show when it finally get done. Definitely a one of a kind kitchen.